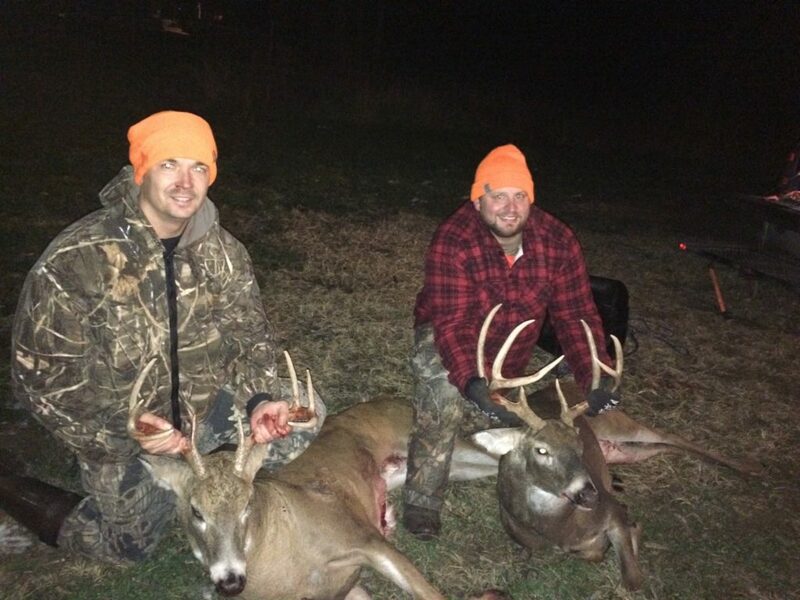 On November 9th my friend Mike and I left for the hunting trip of a lifetime. It was an early morning for me and a long night for Mike He had just gotten off of work at 4am. We loaded the truck up to head to Missouri. After about 11 hours of driving, we make it into Missouri. Mike and I still needed to get our license from the Walmart in Bethany, MO, we get to the counter and tell the man we need to purchase our out-of-state license. He reply’s I need to see your Hunter Safety card. Mike and I looked at each other and our jaws dropped. We didn’t have them. The guy behind the counter no problem just call home and have them give your number over the phone. Well for Mike that worked, but for me, I didn’t have mine at home. I started to get really nervous because I thought I was not going to be able to hunt. The Northeast region DNR was a big help to me. I called the number and she said she would contact the Michigan DNR to get my number. Unfortunately, at that time the individuals who could get the number were not available or in the office. I then made a few phone calls and after an hour and a half at Walmart we both have our license. We continued on our final leg of the trip, 45 minutes to camp. Camp was very nice and comfortable. We were greeted by the rest of our hunting party. That night we talked about which properties we would hunt and scout. One really nice thing was there were maps laid out with prospect spots marked on them so we used that information to get a good jump on where to start our scouting. Mike and I wake up and head out towards the property we decided to hunt. 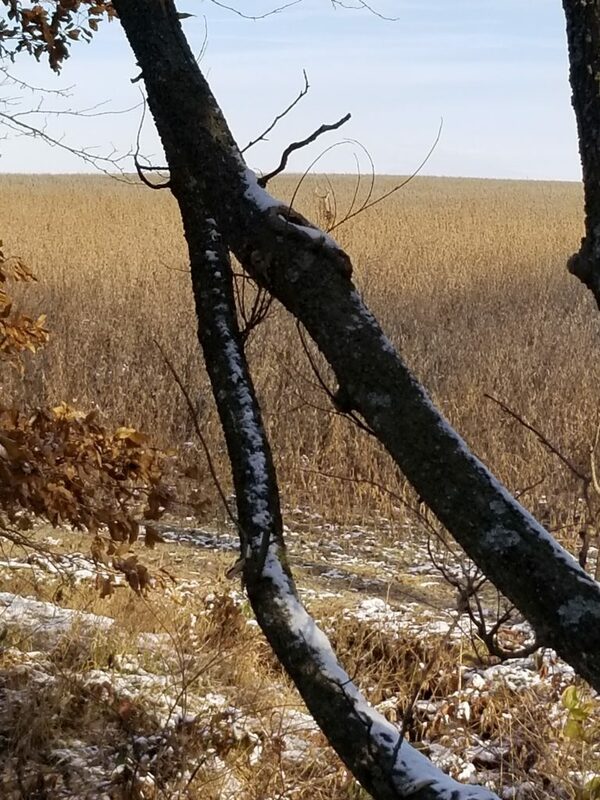 Once we got out to the property there was snow all over the still standing beans and the scenery was absolutely amazing. Mike and I get our gear on and start our walk. We hit the corner of the woods and to our amazement we saw the largest rub I have ever seen and it was fresh. This only brought more adrenalin to Mike and I. We walked a couple hundred yards following the tree line and bean field. We got to another finger that looked really good. Lots of track, scrapes and rubs all over. We decide to look around for a nice place to set up a spot on the ground for Mike. Once we set up his chair he wanted to look around a bit in the area because we knew there was an old tree stand that the maps provided called out. As Mike was walking he noticed the old tree stand. He checked it out as I was still sitting admiring the spot we put Mike’s chair in. As Mike started to walk back to me he bends down and picks up a shed horn from the previous year. 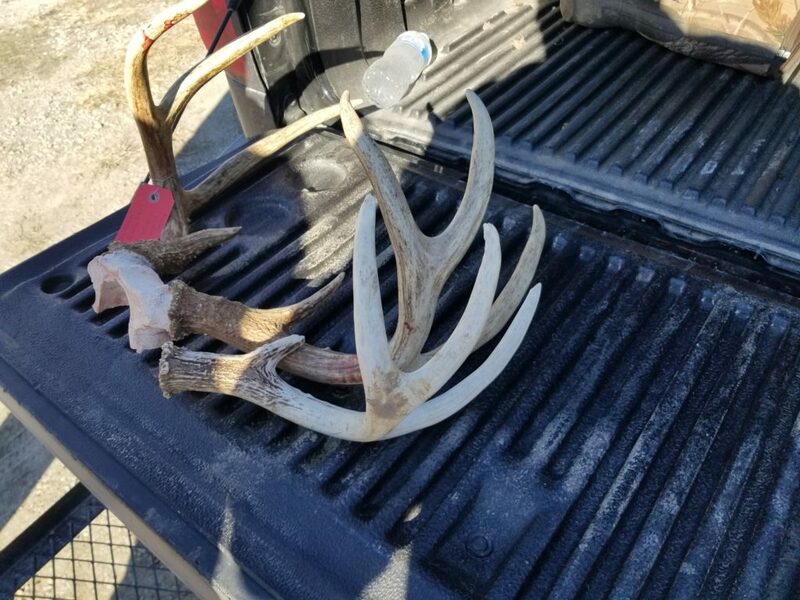 It was a nice size shed antler that only added to our excitement. Mike brings it up to me and then says he wants to look at the tree stand that is set up and make sure its secure because he wanted to get off of the ground. We checked it out, fixed it up and thought it was a perfect spot. We then started towards the area I wanted to scout. Using the maps provided and talking with Gary we moved across the property to another spot. We again find lots of scrapes and rubs in the area. Since I had a climber tree stand we found a tree that over looked two bean fields to allow for a shot in either field. Happy with the spot we headed back to camp. Can you spot the buck in the “as far as the eye can see” bean field? IT WAS COLD. The weather report called out for 10 degrees and wind blowing 30 MPH. Driving to the spot Mike and I thought we would be tough and say were going to sit out all day. We had our lunch packed and were prepared. Mike dropped me off first at my spot. As I get to my climber. I realize I forgot my seat to my stand. I decide I will stand on the treestand because Mike was parked a long way away from where I was hunting and it was almost light. Right after sun up on the edge of one of the fields, I see some movement. I then notice it was on the back side of a hill and I could only see horns. I hit my grunt call and the buck makes an immediate turn and starts walking across the field. My heart starts pumping. I pull my gun up and look through the scope. The horns are well above and outside of the ears. I start counting the points and it’s a 6-pointer. Since this was not a shooter, I admired the buck as it gracefully walked across the field and into the woods I was sitting. At about 10:30 am, I see the 6-point again now in the other field I could see. He came about 15 yards from the tree I was sitting in and never flinch as he walked by. About 11 am, I was so cold I couldn’t feel any part of my body. I texted my buddy Mike and said I was heading to the truck to eat lunch and warm up. He said he was as well. We met back at the truck and said well we might as well go back to camp to warm up and eat lunch. Mind you, Mike and I were the youngest two in the group, but the only two in camp who went back on opening day. We ate lunch and took a nap. We woke up about 1:45 pm and headed back out. I said to Mike I was going to keep looking for other spots to hunt. 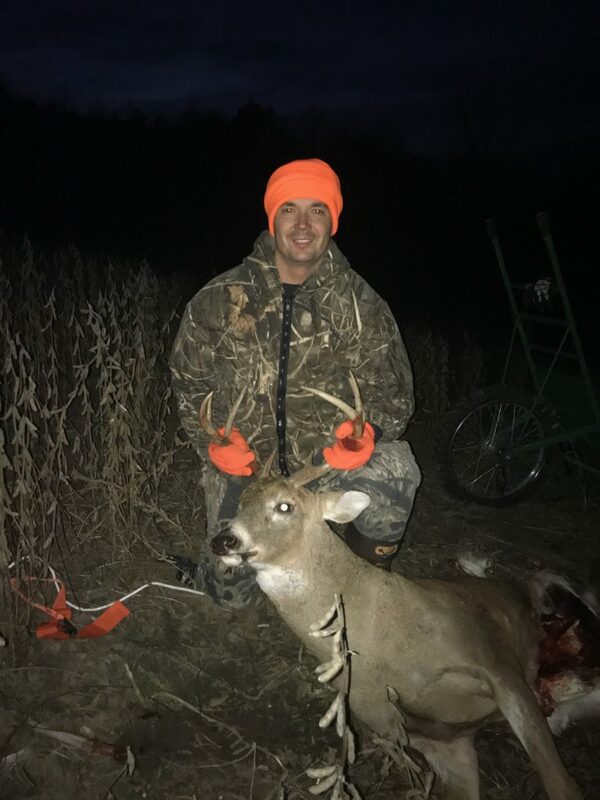 Mike joked and said, “He wasn’t even going to make it to his spot, he was going to crest the hill we had to walk over see a massive buck get on one knee and shoot it.” We laughed knowing this probably wouldn’t happen. We got to our parking spot and Mike got ready faster than I did. He started to walk to his spot. About 10 minutes later I left the truck to scout. I just reach the wood line and I hear BANG couple seconds later BANG. All of a sudden my phone starts to vibrate and he texted, “Just shot!” I start walking towards Mike and come around the corner just as he is getting out of his tree stand. I walk up to him and he said, “I got up in the tree. I looked at my phone it was 2:31 pm put my phone in my pocket saw the buck run into the creek bed, shot the buck, ran back towards the beans stopped. 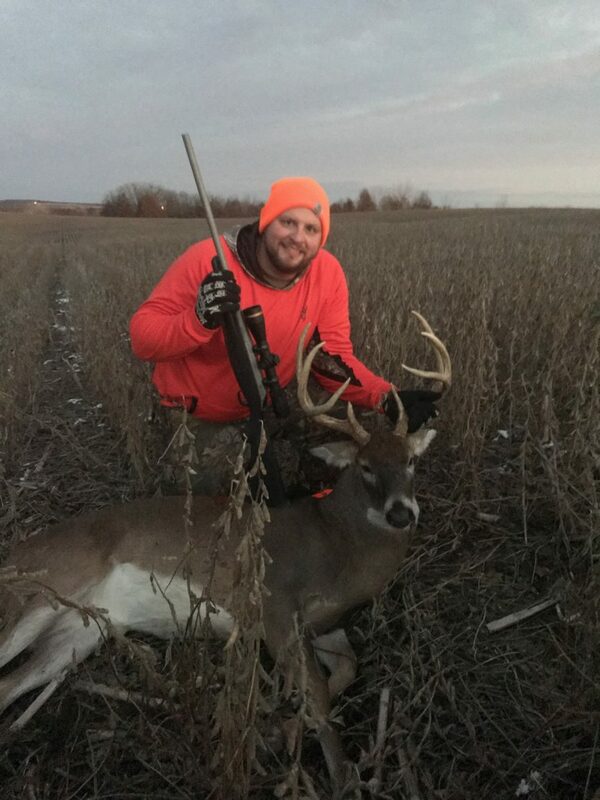 He shot again deer ran 10 yards into the beans and dropped he set his gun down pulled his phone back out and it was 2:33 pm.” We were both really excited. He felt bad because he thought he ruined my hunt but I was pumped for him. He said while I gut my deer why don’t you hunt and when I walk by to go back to camp to get the cart I’ll get you. So I went back closer to where we saw the big scrape the day we scouted and sat on the ground waiting for Mike. About 40 minutes later Mike comes walking by. I get up and we head back to camp to get the cart and change our clothes. Once we have the cart we head back to get Mike’s deer. On the way back I say to Mike, “Since you got your buck, I am going to take note and tell him now once we crest the hill I am going to see a big buck get on one knee and shoot it!” We kind of chuckle then realize that we had a drag from hell coming to us because Mike’s deer was so far back on the hilly terrain. We park the truck and I go to grab my 450 bushmaster. I realize I left my clip in my hunting pants that I changed out off. I tell Mike well I’ll put one in the chamber and one in my pocket. So we start walking quietly talking. As we start walking up a hill Mike stops and says “Big buck!” I look up and say where!!!! He says right in front of us only can see horns. I slowly bring my rifle up and look through the scope. The deer picks his head up and is now staring at us as we are staring at him. I whisper, “Really tall narrow rack 8-point defiantly a shooter.” The deer turns and starts walking and we lose site of the deer. I start creeping up the hill and all of a sudden the deer starts walking up the other side. He becomes clear. This thing is a cow. I get on one knee and the adrenaline hits. I am breathing heavy can’t keep the scope on the deer. I start to tell myself aim small miss small. I try to time my shot. I squeeze the trigger and shoot about 3’ over his back. He looks towards us but doesn’t run. He started to walk again. I am now scrambling for my next shell. I find it put it in my gun. Try to calm my nerves even more. I slowly pull the trigger and click. I didn’t seat the bolt all the way. I push the bolt forward and make myself as small as possible I am feeling more comfortable with the shot but still breathing heavy. He is now 175 yards away. I set my scope to 175 and squeeze the trigger and he drops. I start jumping up and down screaming with excitement Mike then says it’s picking its head up. Since I am out of bullets I hand my gun to Mike and start running to the truck. Now mind you I am 6’3 and weigh 300 lbs. The truck is roughly 300 yards away and uphill from us. I make it about 100 yards and I am breathing hard. I have to walk the rest of the way to get my pistol. I head back and Mike says he never oved again after he lifted his head. After all the excitement, Mike and I think to ourselves this is really going to be a chore because now we have two to get out. We decide to go get Mike’s deer first because it was starting to get dark. We load his deer up on the cart and struggle on the first hill. We make it about 10 yards at a time breathing heavy. Once we get to about the 100 yard mark we call Mike’s Dad and other hunting buddies. To tell them the good news. Mike and I then continued to pull and push this deer on the cart we had. We make it several hundred yards and stop. It is now pitch black still cold as can be and were pooped. We call Gary and ask if we can drive the truck in the field. Thankfully it was ok for us to do this. So we left Mike’s deer on the cart with a head lamp and went back to the truck. While driving out with the truck we had a general idea of where my deer was. So we slowly started to drive the field. We located my deer. As I started to gut my deer the Calvary showed up, Mike’s Dad and buddy Ross. It was a happy moment. Mike and I were spent. As I started to gut my deer the rest of the guys went to find Mike’s deer. I say find because the headlamp that we put on the cart died. Regardless they found it. They pulled it up to the truck the last 100 yards or so and loaded it into the truck. We did the same with mine and headed back to camp. A big thanks to Gary with Wild Game Dynasty for the great experience and information on each property. It was surely a hunt to remember.